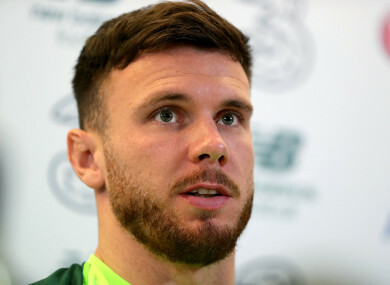 Scott Hogan pictured speaking at an Ireland press conference. SCOTT HOGAN IS aiming to put aside frustrations at club level as he prepares for two crucial Nations League games for Ireland against Wales and Denmark in the coming days. Since joining Aston Villa from Brentford in January 2017, Hogan has struggled to establish himself as a first-team regular amid inconsistent form that saw him find the net just nine times in 42 appearances in all competitions last season. The 26-year-old was heavily linked with a move to Sheffield United in the summer transfer window, but ultimately stayed at Villa. An injury suffered in pre-season meant he missed the opening few games of the campaign, while he has failed to get a look-in despite recovering recently. The recent departure of manager Steve Bruce from the club, who are currently 15th in the Championship, means Hogan could be given more chances to impress under the yet-to-confirmed new boss. It’s a fresh start in terms of identity, a way of playing, and for lads to step up and prove they can play in certain situations, styles and formations. Whoever comes in will be asked to implement an attacking style, which the fans want. “That’s how I play, and that’s where the best of me comes out. It’s up to the lads to establish themselves and impress whoever comes in. Recent reports have suggested the club have lined up Arsenal legend Thierry Henry as manager with former Chelsea and Villa defender John Terry in the role of assistant boss. “To have the chance to work with Thierry Henry, probably the greatest Premier League striker, and obviously JT played for us last year, probably the best Premier League defender ever. So nothing’s been confirmed yet, but the club Aston Villa, we know the size of it, these names are going to be linked to us. Meanwhile, the Irish team has struggled for goals of late, with even boss Martin O’Neill admitting that they current lack a natural goalscorer. Hogan, however, insists there are players in the squad with the potential to fill the post-Robbie Keane void. We’ve got lads in training who are goalscorers. But obviously, you [need] a chance to prove yourself whoever you are, whichever team you play for. Everyone wants to take a chance, it’s just up to yourself to go and do it. Email “'I haven't been selected for whatever reason when I have been back fit'”. Feedback on “'I haven't been selected for whatever reason when I have been back fit'”.